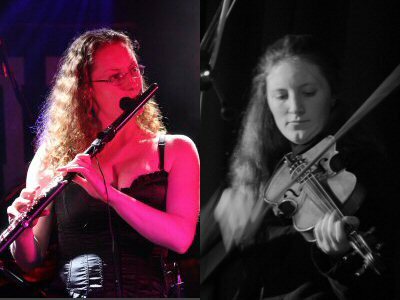 Sisters Catrin and Ceri grew up near Conwy, but currently live in Sheffield and have both contributed to the thriving University Ceilidh Society. They play with various bands, including Treebeard, The Outlandish Knights, Haze, Here Be Dragons, Cadellin and the Paul Pearson Trio. They recently performed at the Smithsonian Folklife Festival in Washington DC, as a duo and also in collaboration with other musicians, from groups including Fernhill, Sild, Burum and Crasdant. They appear as a duo on the CD 'Blodeugerdd', recently released by Smithsonian Folkways, and are in the process of recording their own album 'Deffrown' - watch this space! Cat & Ceri appeared at Chris's 50th Birthday Party at The Burton Street Foundation on Sunday 10th April 2011 and The Folk Thing Festival on Saturday 16th April 2011. They also played the Snowdon Fiddle Festival with Richard Harding as "Over The Moon" on Saturday 11th June 2011.